I don't know if I considered myself lucky or unlucky. 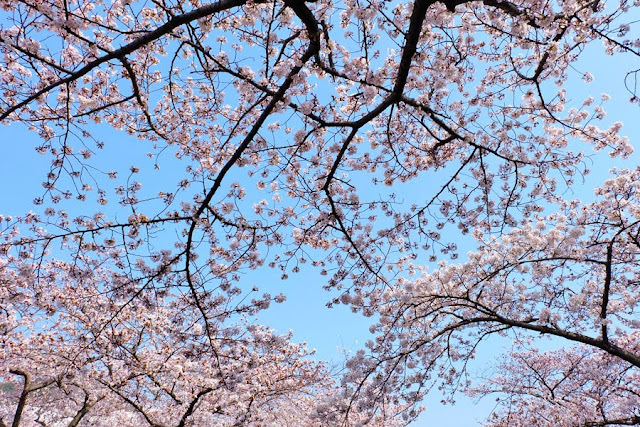 Lucky that the cherry blossoms were already blooming when I was in South Korea? 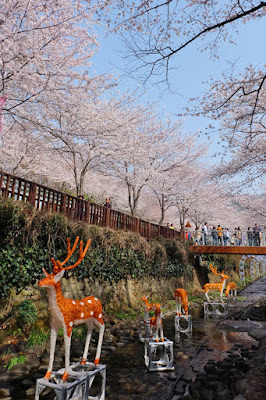 Or unlucky that the only day I could squeeze in a visit to Jinhae was a Saturday which turned out to be the day before the first day of the Jinhae Cherry Blossom Festival? There was a ton of people and it was definitely an "expectation versus reality" experience! 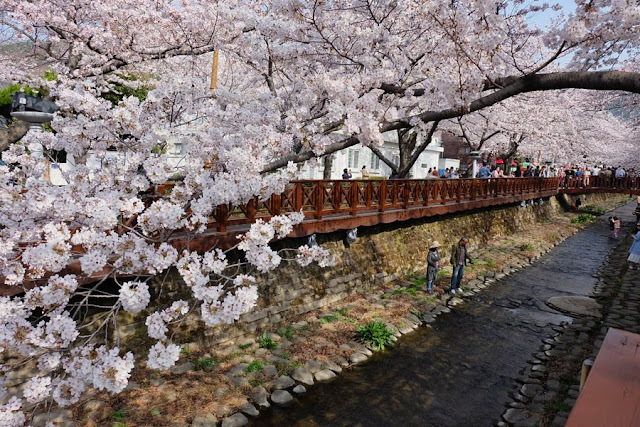 It was a beautiful burst of flowers running about 1.5 kilometers alongside Yeojwacheon Stream. 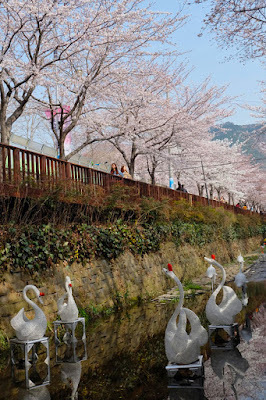 Some sections of the stream below were decorated with swans, deer, arches with hearts; and above were fairy lights, stars, and colorful umbrellas. On the road running parallel to the stream food stalls were set up, and there were people selling cherry blossom related and pink stuff. 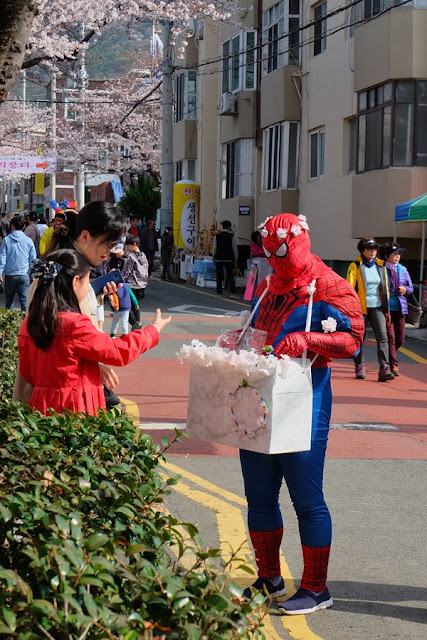 There was even a guy dressed up as Spiderman selling cherry blossom crowns. (Many of the female visitors were wearing these crowns!) It was quite crowded at the southern end (near Jinhae Station) of the stream. 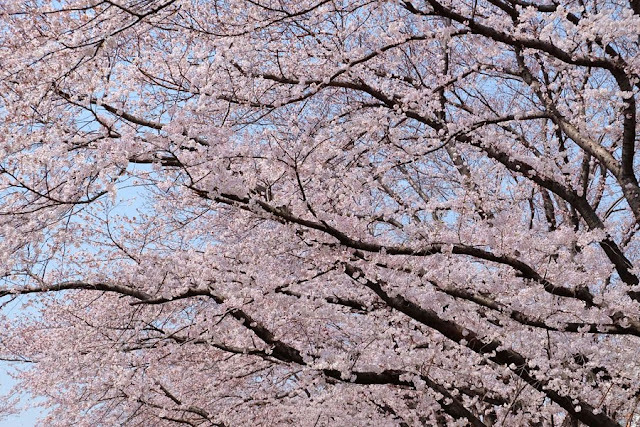 The blooms became thinner towards the northern end, and so did the crowds. Would you buy a cherry blossom crown from Spiderman? 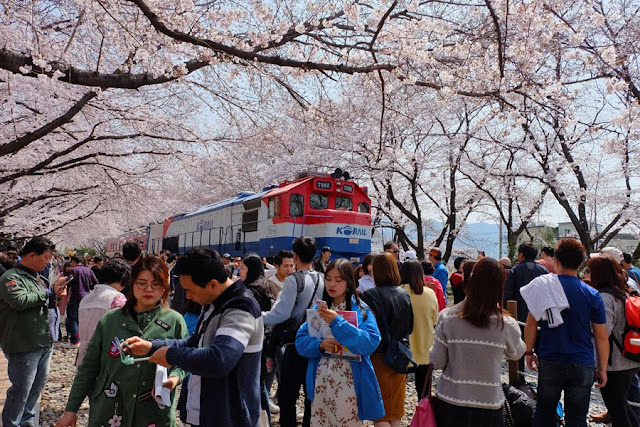 The attraction at Gyeonghwa Station was the cherry-blossom-canopied train. 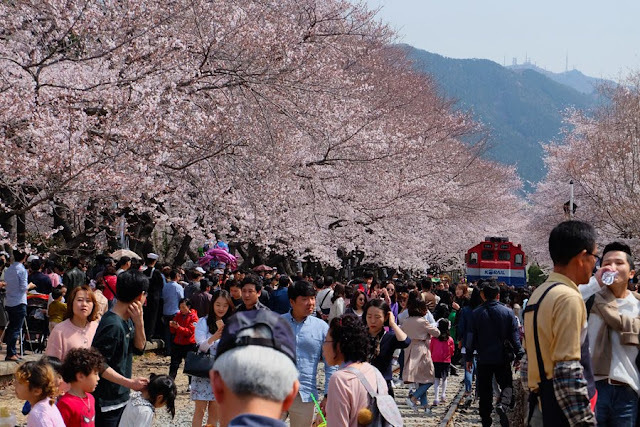 If it was crowded at Yeojwacheon Stream, it was a whole other level at Gyeonghwa Station!!! The queue to have a photo in front of the train was so long and the crowd around the front of the train so thick, it would have been a nightmare for enochlophobic people! 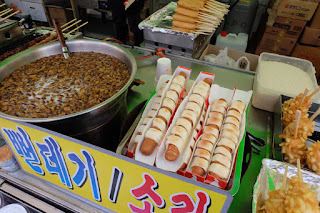 Directions to Jinhae from Busan: Take the subway to Sasang Station. From Sasang Station, walk to Busan Seobu Intercity Bus Terminal. 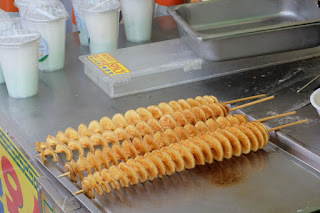 And from the bus terminal, take a bus to Jinhae (5100 won, 1 hour). 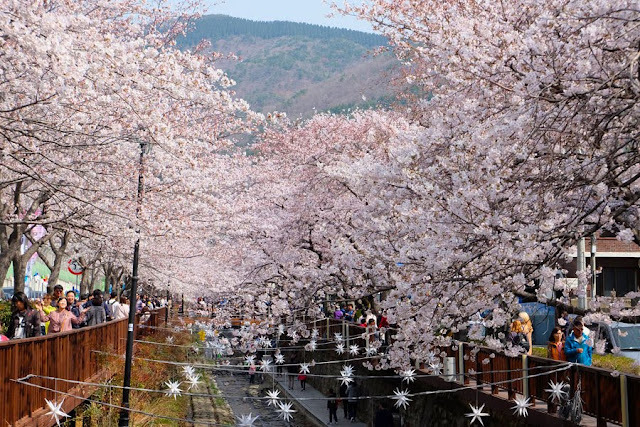 There are buses to Jinhae every 15-20 minutes from 6AM to 9PM. 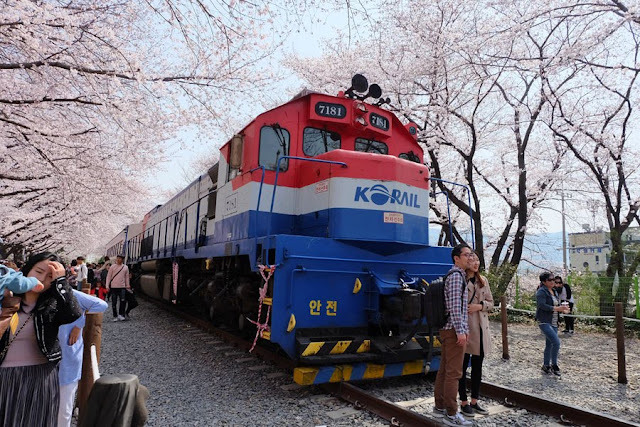 Directions from Yeojwacheon Stream to Gyeonghwa Station: Take bus 317 to Gyeonghwa Station bus stop (1300 won cash / 1250 won transportation card). 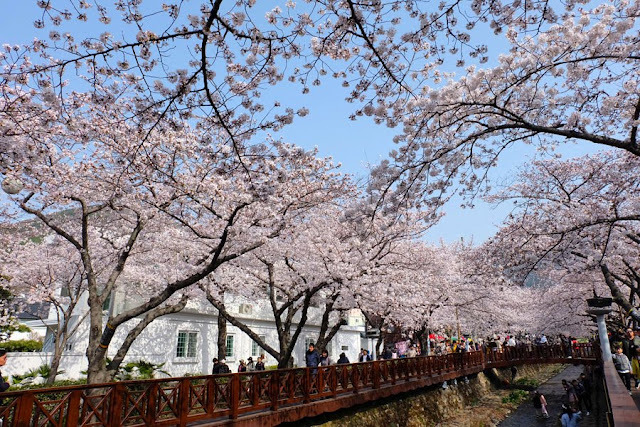 Directions from Gyeonghwa Station to Jinhae Bus Terminal: Take bus 307 to 남원로타리 Namwon Rotary bus stop and walk to Jinhae Bus Terminal (1300 won cash / 1250 won transportation card).